Changing the engine oil should be done by an expert repairer, we recommend an Authorised Mazda Repairer. In order to keep the maintenance interval (page 6-3 ) and to protect the engine from damage caused by poor lubrication, it is vitally important to make use of engine oil with the correct specifi cation. Do not use oils which do not meet the below specifi cation or requirements. Use of unsuitable oil may lead to engine damage which is not covered by the Mazda Warranty. *2 For African nations, use SL or higher engine oil with the SKYACTIV-G 1.3 and SKYACTIV-G 1.5 LP (Low-Power) engines. Engine oil viscosity, or thickness, has an effect on fuel economy and cold-weather operation (starting and oil fl ow). Low-viscosity engine oils can provide improved fuel economy and cold-weather performance. When choosing an oil, consider the temperature range your vehicle will operate in before the next oil change. Then select the recommended viscosity from the chart above. Using oils of viscosity besides those recommended for specifi c temperature ranges could result in engine damage. (SKYACTIV-D 1.5) SKYACTIV-D 1.5 uses specifi ed oil. Please confi rm the specifi cation in owner's manual. If engine oil other than the specifi ed oil is used, the Diesel Particulate Filter effective period of use will be shortened or the Diesel Particulate Filter may be damaged. It is normal for all engines to consume engine oil under normal driving conditions. Engine oil consumption may be as high as 0.8 L/1000 km (1 L/800 miles). This may be as a result of evaporation, internal ventilation or burning of the lubricating oil in the working engine. Oil consumption may be higher when the engine is new due to the running-in process. Oil consumption is also dependant on engine speed and engine load. Under extreme driving conditions, oil consumption may be higher. Whenever the engine oil is replaced, the vehicles engine control unit needs to be reset as soon as possible. Otherwise the wrench indicator light or engine oil warning light may turn on. To reset the engine control unit, refer to the vehicle engine control unit reset procedure on page 6-27 or consult an expert repairer, we recommend an Authorised Mazda Repairer. Inspect the engine oil level periodically. When inspecting the engine oil, if the engine oil level is exceeds the “X” mark on the dipstick, replace the engine oil. This should be done by an expert repairer, we recommend an Authorised Mazda Repairer. 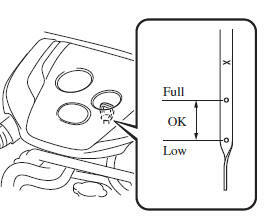 When replacing the engine oil, inspect the oil level using the oil dipstick and refi ll so that the engine oil level is within the range between Full to Low as shown in the fi gure. After replacing the engine oil, have a repair shop such as an Authorised Mazda Repairer perform the initialization (engine oil data resetting) of the recorded value. 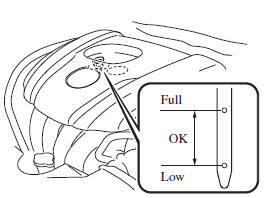 If the value recorded by the computer is not initialized, the wrench indicator light may not turn off or it may turn on earlier than normal. Switch the ignition ON with the selector pressed, and press and hold the selector for about 5 seconds until the master warning light flashes. seconds, the initialization is completed. Turn it off and wait at least 5 minutes for the oil to return to the sump. (SKYACTIV-D 1.5) When inspecting the engine oil level, pull out the dipstick straight without twisting. 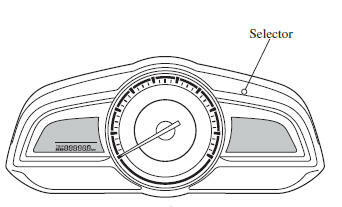 In addition, when inserting the dipstick, always insert it without twisting so that the “X” mark faces the front of the vehicle. Do not overfi ll the engine oil. This may cause engine damage.